Create an end user installation file. Use Winzip and WinZip Self Extractor software to create an exe file that makes it easy for end users to install application updates. WARNING: Your database must be split, never use this method on the Back-end data file. Always make sure you and your end users have backups. Step 1: Zip the mdb/mde front-end file. 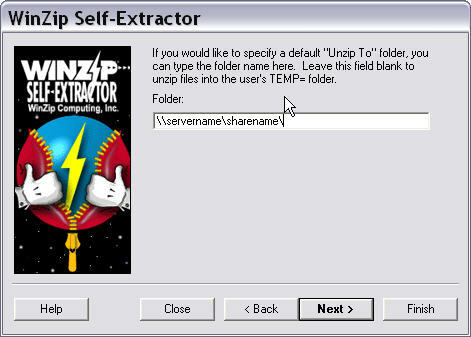 Step 2: Create a Self Extractor exe from the zip file. Step 3: In the WinZip Self Extractor wizard, specify the folder where the Front-End files exists on the End User's network/computer. Step 4: Deliver the exe file to the client for them to install. For this delivery method simply upload the exe file to a web site and create a html page. The page should included the link to the exe file and instructions for the end user. To ensure security the zip file can be password protected and the web site folder could also be configured to require a user name and password. After the client installs the application update, delete the exe file off the web site.